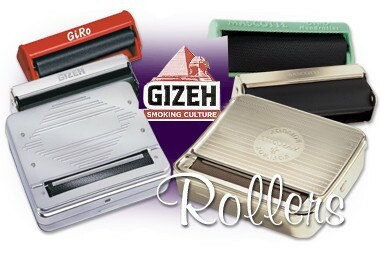 "Gizeh - Eye Candy on a Roll"
For many years, we have been impressed with the look of Gizeh's line of rollers. 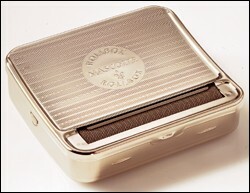 Their Mascotte Rollbox is perhaps the nicest, single, most elegant looking appliance in the MYO world. Rollboxes have been around for quite a number of decades and there is no nicer one than this. Their function is at once simple and complex. They do allow one to easily roll a great stick, but only after a little practice, which mostly addresses putting the proper amount of tobacco into the blanket (apron) and placing the paper (with gum already moistened) in its proper place. The diagram below addresses this (from an earlier look we had at rollboxes several years ago, but the same rules apply). Perhaps the most enticing thing about these rollboxes is their appearance. They are quite beautiful and never fail to attract admirers when you pull one out. And, if the user is adept, the look of admiration turns to one of wonder as a perfectly rolled stick pops out of the top. However don't fool yourself. It takes practice. Using both a "feel" for the right amount of tobacco, manipulating a wet/sticky gummed-edge paper into the right position, and then applying just the right amount of pressure to close the box is an art. I've seen people roll perfect cigarettes incredibly fast with these machines. I personally have had less luck with the "fast" part, but can manage to roll a good stick most of the time. The moistened paper placement (Step 2) seems to be my real nemesis (the paper perpetually sticks to my fingers) but those that have experience, appear to have no problem with that. Of course, I used to perpetually get glue on the windows of my model airplanes (they stuck to my fingers as well - don't even bring up the subject of Bondini or Superglue with me) so perhaps this particular form of dexterity is something that is not in my genes. Gizeh also makes their own brand name version of this box and it works every bit as well. It is not as pretty or perhaps a better word would be elegant but again, in the right hands, this is a significant tool for making sticks every bit as nice as a regular length Camel non-filtered using whatever tobacco strikes your fancy. 70mm is the paper size required for these two machines but there are other brands that roll up to 100mm sticks. They just don't look as nice and, in most cases, are not nearly as robustly built. Follow the directions you see below if you find yourself in possession of one of these ( truly, most RYO enthusiasts really should have one). These machines WILL work, and soon we'll put a video in the MultiMedia Section under "Hand Rollers" so you can see my dubious talents with this device. Perhaps, by the time I do the video, I may be pretty good at it. It will be fun whatever the outcome. I'll write some special "Mascotte" guitar music for the piece. I wonder what that will be like - with my fingers Superglued together. 1. Open the lid and fill the trough of the band with tobacco. For economy and efficiency start by using just enough to fill the trough. Too much makes the machine difficult to operate. 2. Moisten the gum on a rolling paper and place this on the band with the gummed edges uppermost and the lower edge behind the tobacco. 3. Start closing the lid in order to engage the paper in the band and then complete this movement, closing the box with a slow uniform pressure on both sides of the lid. The paper and tobacco will then become perfectly rolled and will appear through the closed lid. Now for some reason, Gizeh does not yet make a roller for King-Size (97mm) papers, even though they make superb papers of such length. I would assume that small oversight will and should be corrected. As more folks come to MYO/RYO from the ranks of packaged cigarette smokers, those that do look for a non-filtered longer stick will look as well, of necessity, to longer rollers. There are already many fine ones out there as we've mentioned in the last few issues. However, we feel that Gizeh should have its own entree in that category, and one with the same kinds of pizzazz that their Mascotte line of smaller rollers possesses. For instance, the metallic line with top closing hatches. This company employs the best of German engineering in this design without using the fact as advertising hyperbole. So I'll use the hyperbole. 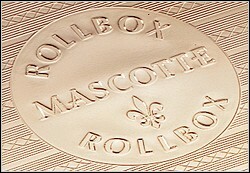 Their small Mascotte metallic is quite attractive. Since it will roll a 79mm paper, extending it to the near 100mm King-Size length should not present much of a problem. The top closure puts the whole package together with a bit more class than typical open style rollers. It looks more like a finished product and the top-closing lid does help with paper placement, and to a lesser degree, the pre-roll of the tobacco itself. Their small rollers were the first we saw with the hatch that closed over the roller after the loading, and even if the metal one may not be as cost-effective as a first foray into the King-Size/100mm world, their equally attractive, though plastic, Lime Green roller with embossed badging (at right) should be. Because the top folds down, they are less likely to come apart in ways that would make them more vulnerable to breaking when carried in a pocket. All the blankets are well-textured to grab both the tobacco and paper efficiently. Still we hope they will make longer one's as those are easier for someone with larger hands, such as myself, to use and I do like a longer stick when rolling. However, for most people, the smaller ones are a lot more portable and since Gizeh has a dyed-in-the wool European outlook regarding hand rolling, their papers and manual dexterity often get more attention. I suspect that in the future, given their outstanding tubes and damn good hand injectors, Gizeh will eventually develop a larger roller AND perhaps, even a table-top crank-style as well. The point is, whatever they do choose to make, you can bet it will be attractive and sturdy. Again, the little handrollers are practically indestructible and for those with the need to travel light, these little guys will get the job done. And more than that, almost anyone will be able to roll sticks as nice as the one above - and very quickly at that. Check out the Hand Rollers Section in the MultiMedia part of RYO Magazine. It will help. Let us know your thoughts regarding ideas for new rolling machines and especially your experience with those that currently exist. We are, for the most part, injector-heads here at the magazine and would greatly appreciate any tips and experience you have had with any of the various products of this type that are available, or should be. Also feel free to Share with us any really unusual or older ones we have not discovered by attaching a JPEG of it (please keep file sizes less than 30k), along with a brief history as to how it came into your possession. We will likely use it in future issues. If you have some real "treasures" - share them with us and our readers. Contact us by clicking here or go to our Contact page for more information on how to get sample products to the magazine. 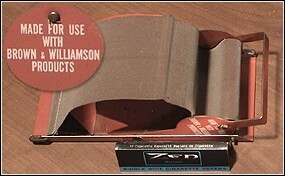 For instance, we've received several of these old Brown & Williamson (Bugler) hand rollers from readers. They are actually some of the best rollers ever made but are a bit large (nearly the Size of an Excel). However, they really work. At left is a picture of the machine with a pack of ZEN papers (regular - 70mm length - which is the required size) to give you some perspective of its size. The roll is accomplished in this photo orientation from right to left. The animation at right shows you the tobacco packing into the blanket indentation, the beginning of the pre-roll, the insertion of the paper, further movement of the handle until the end of the cycle with the handle at the extreme left. The next picture (below right) is shot from a different angle to show you the finished stick emerging at the end of the operation. This machine makes perfect sticks effortlessly. The right amount of tobacco is easy to put into the indentation and the size of the handle and its easy grip make the start of the pre-roll quite easy. Further, the insertion of the paper is really easy as well with the one exception that, like a roll box, it is better to lick the paper before placing it in its position. (Picking up the whole roller and licking the paper after it is in place would be cumbersome.) Again, the next picture shows from the finishing end (the left side in the original photo above) the finished stick emerging from the blanket. The roll is perfect, tight but not too tight, and in six tries, I got six perfect sticks just like the one shown above. With a thicker paper, it would be hard to tell from a manufactured stick. Even though the machine is large, I am surprised this is not the design choice still for those who want an unfiltered smoke. The finished stick diameter is about 7.2mm, a bit slimmer than a standard cigarette but larger than a true slim. Again, that's a regular length but packed so well that the stick smokes with an elegant mildness. And as far as being the choice for home handrolling, I am sure the patent could not possibly still be in effect, as this machine must be at least decades old. The final graphic shows the bottom of the roller with various information including roller blanket (apron) replacements for a nickel. That price probably puts the date of origin somewhere in the late 60s or early 70s, as you can't even buy a stick of gum for a nickel nowadays. This is a design that should be looked at once again. Think of it as a table top roller for those that don't like filtered tubes but want a machine that will roll at almost the same pace as an injector injects. Sometimes older designs really can be better than newer ones and in this case, I'm convinced this is the roller I would design were I to market a "better mousetrap." There is another large roller, the "Filtermatic" we looked at years ago, but while it rolled great sticks (though not ten at a time as it claimed), the papers were double length and hard to find and the resulting rolled stick (which was perfect every time) had to be cut in two (unless you wanted a cigarette as long as Natasha's from the Rocky & Bullwinkle show). 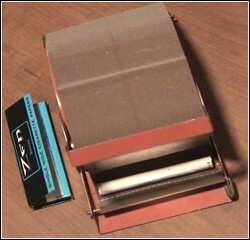 The problem with the Filtermatic was/is its high price (Supermatic territory or higher) and the difficulty folks have finding the specific papers that work with this machine (Cascade Cigar & Tobacco has 'em). This more sensible B&W design reminds me of the more practical nature of inventors decades ago - a natural tendency that perhaps has been lost by trying to be too intricate or miniaturized, or even too convenient. It's kind of the same philosophy as the old two stage injector on the Injector Page in this issue. And that thing made the best sticks (even after 60+ years) I've ever seen and will last probably for another 100 years. The only thing that could damage it is rust. Kinda like the human mind. Of course, we'll do a video in the MultiMedia Section on this old B&W roller too, if for no other reason than to honor it as a piece of well thought out history. Frankly I hope someone will re-create it. I'd sure use it. We get a lot of mail about handrolling techniques and we feel it is pretty obvious how to accomplish this feat with simply tobacco, paper and two hands (in some cases one). So, we will continue to repeat the techniques, tricks and tips for true hand-rolling. As a preface, however, suffice it to say that hand rolling is mostly a matter of practice - not secrets. It is art, not science. In addition to the pictorial demo that remains below, and the more comprehensive videos in the MultiMedia Section on this subject, we asked Lisa (from Gizeh's corporate office in Germany), who is an expert handroller (as there are many more European hand-roll smokers than found in the US ) to give us a quick demonstration. The following is a Window Movie Video, so Mac users will not be able to access it without downloading the Mac version of the latest Windows Media Player. Give it a try, especially if you have a broadband connection. We compressed it as much as possible, and without sound, so even those with phone connections, with a little patience should be able to view it. A little over one Mb file. If it doesn't load properly, check your media player to make sure in the "file types" setting, your player is not sharing Windows Video with other players. If enough Mac users request it, we will provide an MPEG video as well in the future. Click here to access the video or look at the steps below if you need help with your hand rolling technique. For those of you who can see the video, you will notice that the pre-roll stage is the most important and time consuming part of hand rolling a well formed stick. Notice how Lisa spreads the tobacco evenly and gently "rocks" it back and forth in the paper until consistency is achieved throughout the length of the unrolled paper. Only then does she lick the paper and roll the final product. She savors the experience, as should all smokers, of using tobacco and takes her time with her rolling. Smoking tobacco should not be associated with an obsession for speed (time) or with any other obsessive behavior for that matter. It is a true luxury to be savored. Using your thumbs and index fingers, work the tobacco until it takes cylindrical form (which isn't more than a couple of rolls, back and forth) then roll it up lick and seal. If you roll it too much it gets too tightly packed and will not smoke well. Next, pinch the shaggy scraps hanging out the sides and toss them back in your pouch to be recycled. then pick an end that looks the best and using your thumb nail or finger nail bend in the very tip of the paper inside the cigarette cylinder. This makes a rim and provides you with a more stable cigarette and prevents little scraps from getting attached to your lips.